The second quarter ends in less than two weeks. When it does, I expect Apple will have over $70 billion in Cash, Cash Equivalents, Short-term marketable securities and long-term Marketable Securities. That figure has been growing predictably. The values of the profitable phone-making subsidiaries are a bit more difficult to estimate but we can use multiples of trailing operating profits. I generously use the multiple applied to HTC (14). 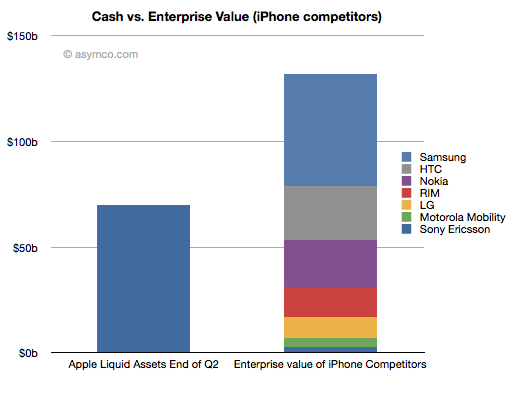 Given the current valuations, it would not be difficult for Apple to acquire every phone vendor except for Samsung with cash alone. The more remarkable thing is that as market values of phone vendors continue to decline, Apple’s cash will continue to grow dramatically. Indeed, a time may soon come when Apple’s cash will be worth more than the entire phone industry.